Singing Praises to God has once again proved to be a mighty power defeating the enemies of God’s people. In this case, it was a 9-year old boy who triumphed over an adult abductor, simply by singing ”Every Praise” by Hezekiah Walker over and over again. This reminds me of two records in the book of Acts where God released first Peter and then Paul from prison. Singing praises to God is a powerful way to curb the enemies of the Lord. It also reminds me of David playing music to calm the demonized King Saul. The young boy, Willie Myrick, is an amazing example of a believing believer to the whole world. How many boys, even Christian boys, would not be terrified when abducted by a stranger? The fact that Willie chose to sing rather than fear and cry demonstrates many things but two come to my mind immediately. First, he must have Christian parents who are truly bringing him up in the nurture and admonition of the Lord, and secondly, Willie has already developed a powerful relationship with our Lord Jesus Christ. Praise be to God and our Lord Jesus Christ! 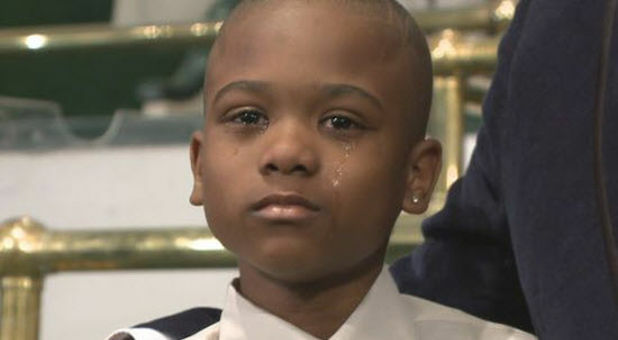 A 9-year-old boy’s might have saved his life by singing a gospel song. Willie Myrick was kidnapped from his Atlanta driveway earlier this month by an unknown man. According to police, the kidnapper dropped him off unharmed after driving him around for hours. Myrick said he continued to sing the gospel song “Every Praise” by Hezekiah Walker until the kidnapper grew tired of cursing and telling him to shut up. He eventually threw him out of the vehicle. Inspired by the boy’s story, Grammy-Award winning artist Walker visited Myrick at Mt. Carmel Baptist Church last week. Watch the video below and find out more about this remarkable story. The Word of God sung out loud is a powerful way to shine light into darkness. Christian music is a powerful way to subdue the enemy. Get singing!